I’ve always been into tactics games, but the exclusivity of the fanfare around the original Frozen Synapse always made it feel like a niche of its own. 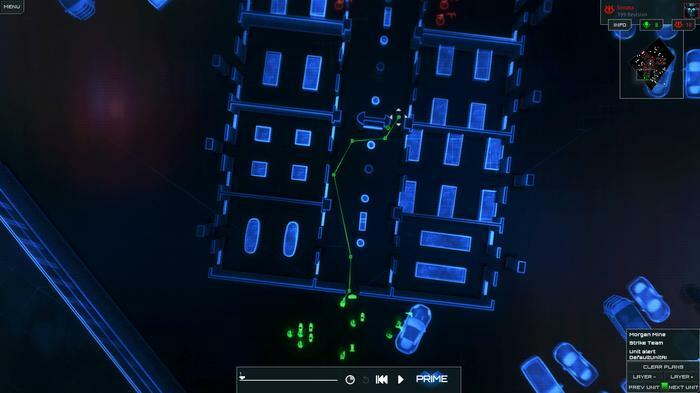 Where other tactics games relied on turn-based pacing, Frozen Synapse emphasized an interesting hybrid of pause-and-play and asymmetrical real-time strategy. Throw a minimalist cyberpunk aesthetic and a wicked soundtrack on top and you’ve got yourself a groovy package. The follow-up, Frozen Cortex, was arguably even more niche. It took the unique formula behind the gunplay of the first game and recontextualised it. Instead of being tasked with controlling a group of cybernetic soldiers six seconds at a time, you were in command of a dystopian sports team. Now, developer Mode 7 are finally garnishing Frozen Synapse fans with a proper sequel. And while there’s a lot here that’s changed, there’s also a lot that hasn’t. Where the first Frozen Synapse paired together a traditional, story-driven single-player campaign and robust multiplayer, Frozen Synapse 2 really goes to town reworking the first half of the equation. Gone is the linear, mission-by-mission story of its predecessor. In its place sits the new City Mode. This is by far the biggest change that Mode 7 have made to the experience. City Mode looks, feels and plays a lot closer to the grand strategy campaigns offered by something like X-COM than the solo component found in the previous game. You’re tasked with managing the fragile peace within the metropolis of Markov Geist while also investigating the agenda of a mysterious new threat known as Sonata. You’ll recruit soldiers and dispatch them to investigate emerging threats or resolve open disputes between the city’s various factions. Completing contracts earns you money, which can be used for upgrades, hiring new mercenaries and buying real-estate - which expanding your influence through the city. There’s a complex diplomacy system really drives the show here. Part of the setup here is that you’re supposed to be a neutral arbiter in the city’s cutthroat political ecosystem. Ideally, you’ll want to try and make as few enemies as possible in order to most-effectively combat Sonata. Help one faction enough, and you’ll be able to ask them for regular investments in your own capabilities. Alternatively, step on the toes of the wrong people, and you’ll find your efforts to stop Sonata constants interrupted and your forces regularly ambushed. Each time a conflict rears its head in City Mode, the camera zooms in and you’ll be seamlessly pulled into a combat encounter. As with the first game, levels are procedurally generated. 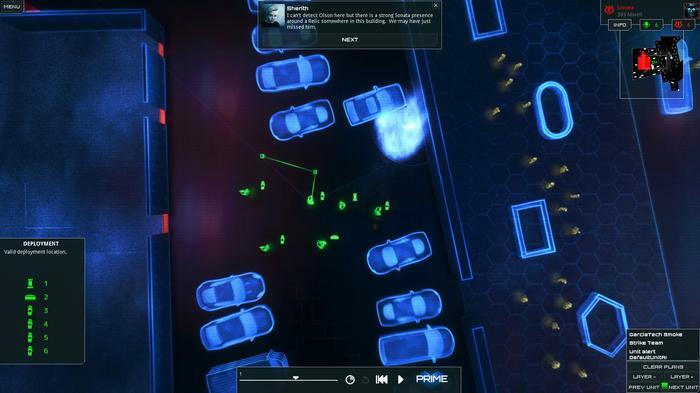 However, compared to the first game, the levels in Frozen Synapse 2 are filled with new terrain objects like trees, rocks and cars. These allow for more dynamic and grounded combat encounters. The gunfights in Frozen Synapse 2 are less abstract, giving it a very different flavor to the original game. There are fewer corridor shootouts and streetside showdowns. Again, the whole thing is also brought to life by a stellar electronic soundtrack by nervous_testpilot and an oozing neon silhouette style that sets it apart from most other tactics games. There’s also a number of new weapons in play, including a Flamethrower, Minigun, Knife and Smoke Grenade. Each of these have their strengths and weaknesses. And even if you don’t incorporate them into your own arsenal, the game throws enemies equipped with them at you frequently enough to keep things interesting. The big-picture meta strategy of City Mode also sometimes bleeds into the smaller conflicts. For example, if one of your squads is ambushed within a part of the city where you hold influence, a few AI-controlled units will come in to back you up. The one irk I have here is that a lot of the depth is a little too hidden away for its own good. The game teaches you enough about the basics of combat but I would have liked a bit better on-boarding for City Mode itself. 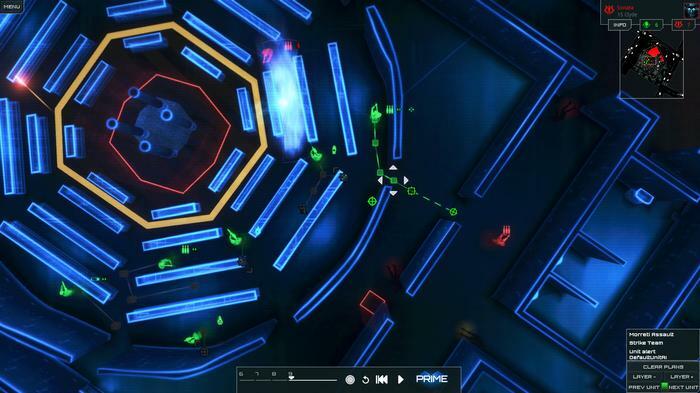 The sum total of the above improvements allows the single-player experience of Frozen Synapse 2 to thrive where its predecessor felt merely functional. It also adds a lot of replay value to the game in a way that the first game didn’t offer. 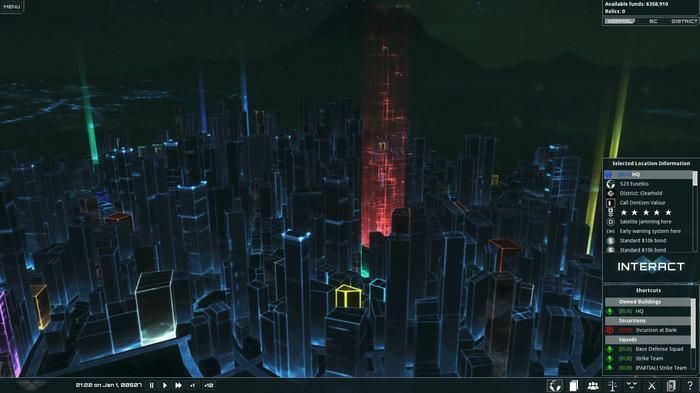 However, for as many improvements as Frozen Synapse 2 makes to the single player side of the equation. The multiplayer experience feels remarkably the same. Yeah, the addition of new terrain features and weapons does shake up the status quo a little. But for the most part, the experience on offer here is the same as it ever was. What's more, absent a port to the Switch or mobile platforms like iOS and Android, that means you’re mostly going to be playing online against Frozen Synapse diehards - which means you’re probably going to find yourself stomped most of the time. Bringing yourself up to their level is possible, but it’s inevitably going to involve a fair bit of trial and error - which feels appropriate but not all that fun. Further dragging things down are a few missing quality-of-life features that the first game had, such as the ability to easily exporting match replays from within the game and a proper skirmish mode. That said, there is a silver lining in that the multiplayer in Frozen Synapse 2 is a surprisingly quick and casual affair. Matchmaking times rarely took more than a minute. Then, once a game has been started and you’ve locked in your first move, you can always jump back into City Mode or start another multiplayer match until your opponent catches up. You don’t even have to keep the game running in the background and if you hook Frozen Synapse 2 up to your Steam account, it’ll send you a notification to let you know when the game is ready to continue. 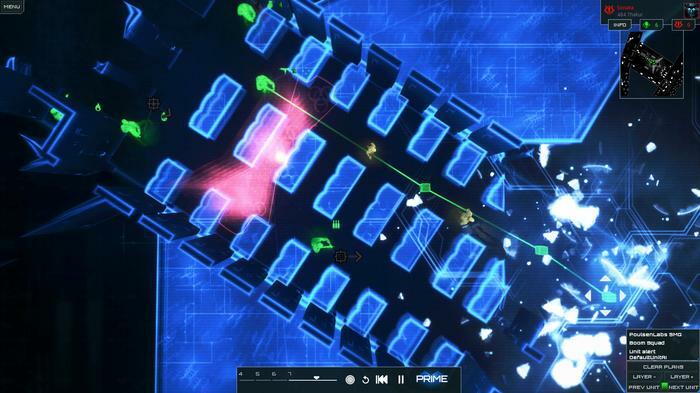 As far as online multiplayer strategy games go, Frozen Synapse 2 is remarkably low-maintenance. 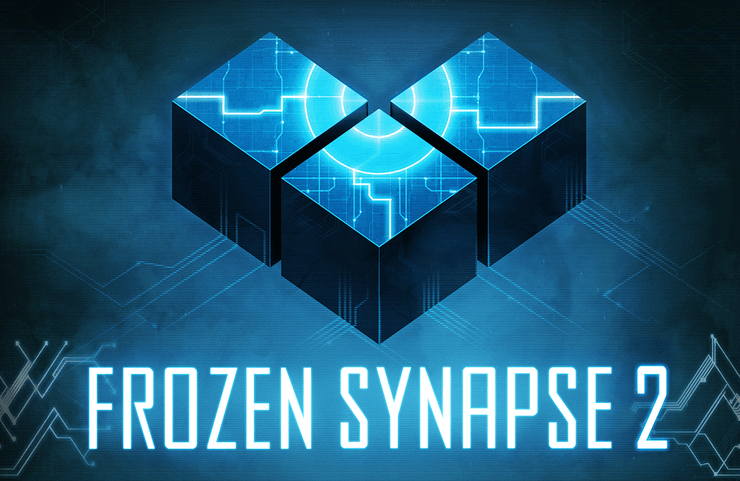 Though I wish more meaningful or thoughtful changes had been made to the multiplayer in Frozen Synapse 2, the substantial improvements made to the single-player experience make for one of the more interesting tactics experiences released in 2018. I don’t know if I’d call it out as a must-have for fans of the genre but it’s definitely worth a look, especially if you got a lot of mileage out of the original game. It’d have be easier to do a by-a-numbers sequel to the original, but instead Mode 7 have opted to radically reconfigure the Frozen Synapse formula where counts and crafted an experience with a much more staying power.